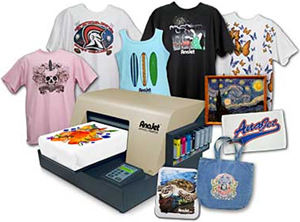 If you are looking for information on the AnaJet Apparel Printer franchise business opportunity, AnaJet franchises or AnaJet T-Shirt Printing franchising, then you have come to the right place. T-shirt Printing - A Recession-Proof Business!! "I printed more than 4,500 shirts in the first two months!" with an AnaJet Digital Printer! Garment decoration is recession proof, according to industry surveys and experts. You can start generating income as soon as you start printing! Some customer sold 4,500 shirts in their first two months - that's over $60,000 worth of business! "My wife can do a $300 order while watching CSI Miami!" "We have been extremely impressed with the tech team at AnaJet... Every step of the way they have been encouraging and down to earth." "I have one and love it. The support they give is excellent. They will walk you through any problems and help you with anything you need, even after training. I just can't say enough good things about AnaJet and the staff."